When it comes to poo, well let’s just say, it makes for a crappy conversation. Although it’s not the first thing that comes to mind when we search for insightful topics to discuss, it’s an important topic with Scoopy Doos in Longmont. We all poo, and with that, we know that there can be changes in our poo that might indicate a problem. It’s not any different for our canine companions. How they poop and what they poop really does matter. Not all poo is created equal. Some dogs leave heaping mounds, while others might leave something that, otherwise, resembles a tootsie roll. Regardless, the act is relatively the same. Although our furry friends can’t talk, they can express their thoughts and feelings, and generally do so through their actions. This holds true while going number two. For example, if your pup cries while doing the doo, chances are he might be constipated. It’s important to know your dog’s poop, as well as his behavior while pooping. I have watched my dogs poop on many occasions. My typical reaction is to turn my head and offer them some privacy because I just wouldn’t want anyone staring at me! I don’t make it a habit to examine what was left in my backyard, but I also understand that my pup won’t be able to tell me about her pile. So yes, at times, I will go look. The question is, what am I looking for? A pile of poo comes nowhere close to that of a diamond, but according to www.petmd.com, a doggy’s doo should be examined, just like a diamond, based on the Four C’s of dog poop – color, consistency, content, and coating. So, know your pup’s poop, look for any changes according to the Four C’s, and seek treatment if your findings deem necessary. As with people, dogs can experience changes in their doody. These changes are typically the result of diet. However, introducing a dog to a new medication, parasites, and illness can be factors that might require treatment. Whatever the cause, it’s important to know your dog’s doo, identify any changes, and do what’s necessary to get your pup pooping healthy! Now that you know what to look for in your pup’s poo, it’s time to clean it up. 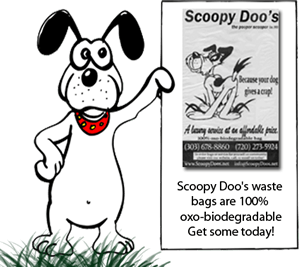 Scoopy Doo’s in Longmont can help with all your poop removal needs.